I will be doing this in the next few weeks as part of a major service. One thing I did notice on my 9'er as the fork dust seals have corroded so I will need to change them ASAP the seals them self looked fine with no visible leaks going to replace the cir-clip to as its a bit corroded as well. Did you get around to doing the dust seals Tam? Mine need doing too. Once the fork legs are off the bike, do the dust seals just prise off? My seals aren't leaking either, so I don't want to do a full fork strip. Yeh, dust seals just pop out. Give it a good clean in there while you have them off. A good coating of grease or Vaseline will prevent any future corrosion too. Thanks guys, that's my weekend fettle planned then - forks out, dust seal replacement and a fresh dose of 15w oil. Is there any advice on whether you should use fully synthetic, semi, etc? any oil better or worse than another from anyone's experience? Any of the 'Hydraulic' type oils specific fork oil or Auto transmission oil or bespoke hydraulic oils, all these are anti-frothing most engine/general oils tend to froth and damping will be unpredictable. Are the fork seals rubber? If so make sure you use proper red rubber grease. Ordinary HMP grease with attack rubber and cause it to swell and cease to seal. I had a rubber bush on my VFR swell by at least 25% because the previous owner greased it. There are a lot of greases out there for specific purposes. I lifted this off the VVFR forum as I thought it might be of help. Good slippery stuff but it’s a liquid and runs every where and can boil off at higher temperatures. Best used in a bath type application where the oil can fall into a container and get recycled back to where its needed, typical example would be the inside of your engine. Or a total loss type system like a Scott oiler. Is essentially Oil in a paste forming a semi solid material. This is good slippery stuff and great for lubricating some thing where you don’t especially need very low drag or where you can’t economically provide an oil bath. A typical application would be wheel bearings spinning at a limited RPM. As above but suited for temperatures a little higher. A typical application would be high speed bearings which run at temperatures above about 110 C.
Grease as above with molybdenum and probably other solid particle friction and adhesion modifiers. Molybdenum is a slippery metal and is added to grease to act as a coating to avoid bearing metal to bearing metal contact under high loads. Typical application heavily loaded roller or plain bearings. Is essentially Copper flakes in a paste. This is ideal for areas where high surface temperatures boil off the paste and the copper flakes remain coating the surface of the components and reduce friction between the two components. It works very well provided there is very limited travel between the two components. A typical application would be certain locations with in brake assemblies more of an anti sieze material than a lubricant. Most of the above products are petroleum based, reliable tried trusted. Petroleum has an unfortunates effect on rubber, it attacks it making it initially swell then harden. Nitrile rubber is more resistant to petrol but not impervious. If you are working next to a hydraulic system then ordinary petroleum based grease can seep under hydraulic seals, attack the seal and contaminate the hydraulic system. For hydraulic systems the red rubber grease has special properties, it will not attack rubber and will not creep under the hydraulic seals. Red grease will not keep your spider man suit supple. It will provide a protective coating preventing the deterioration of the rubber caused by petroleum products. So in the entirely feasible event that you get lucky in Essex with Esso girl (or reading your post, Esso man) then your suit won’t suffer swelling and cracking, unless of course you remove the protective film and you deliberately risk swelling and crackin. The consequences of meeting an old flame or getting on like a house on fire are of course entirely yours to bare. Cheers guys. Is silicone grease the same as the red rubber grease. I have a clear silicone grease that I use for bits and pieces but not electrics. I would say no it isn't. I have a can of Maplin silicon grease spray that I use on electrics e.g. on the contacts inside my old Garmin Quest bike mount. It was supposed to be waterproof but wasn't. Thanks Celtic. I have just changed my fork oil your guide/pics made it easy,the old oil was a purple/red colour, would that be the OE yam oil? Couldn't say really, if the previous owner was anything like me they would have changed it every year. Silicone grease is erm made of silicone, it will not eat your rubber seals and will work fine, but red rubber grease is meant for brake seals and oil seals and doesn't affect brake fluid. Been around for years, made of castor oil and china clays. Here is all the blurb on it. A 1lb tin will last for the rest of your biking days and then some. Lube your brake pistons and seals in it too. If you haven't got a 27mm spanner 1. 1/16th inch AF is 26.98mm and will fit. 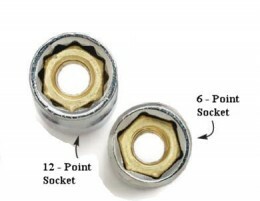 Try to use a six point socket on the alloy cap if possible it will cause less deformation if it is tight as it has more drive contact area. The Walldrive system Sockets take this six point idea further and drive on the faces of the flats. Edited by leehenty, 07 May 2013 - 06:41 pm. Hi Lee, these Walldrive sockets sound very much like same principle as "Metrinch" sockets and spanners. They fit AF and metric, and because they put pressure on the flat of a bolt, the won't damage the corners. Saved me a lot of times.